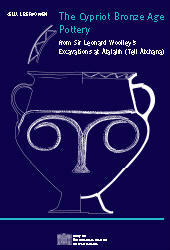 Beginning with Sir Leonard Woolley’s final report on his excavations at Tell Atchana, ancient Alalakh, the chronology of the site’s sixteenth and fifteenth century B.C. levels VI through IV has been largely based on the imported Cypriot pottery: this in spite of the fact that Woolley published only a fraction of the material and not infrequently - as this volume points out - his classifications were incorrect. The first aim of this study was therefore to classify and publish all the Cypriot pottery from the site that is preserved in collections in Turkey and England, and to re-evaluate its significance for the site’s chronology. The resulting catalogue of approximately four hundred vessels is lavishly illustrated by photographs, many in color. The volume opens with a concise analysis of the architecture and material culture of levels VII through III, with special attention to the spots where Cypriot shards were found, from their first appearance in level VI through their last in level II. Although no Cypriot pottery was found in level VII, reconstructions of Alalakh’s history in the second millennium require consideration of the important archaeological remains found there, especially of level VII’s archives that provide evidence for dating the start of level VI. There is a separate treatment of the spatial and typological distribution of the largest concentrations of Cypriot imports in the level IV palace and tombs, and an attempt is made to interpret these both in terms of chronology and social history. Chapter 3 continues with a detailed discussion of the types and shapes of these imports and pursues the questions of chronology and social meaning through a comparative analysis of exports throughout Canaan. Chapter 4 is a critical assessment of the Alalakh chronologies that have been proposed on the basis of textual as well as archaeological data, and includes the new Cypriot pottery evidence. The author argues for lowering the dates for levels VI through IV by approximately a generation.